A long-time favorite among house plant enthusiasts, research conducted by NASA found the Peace Lily to be one of the top indoor plants for cleaning air. This tropical plant breaks down and neutralizes toxic gases like benzene, formaldehyde, and carbon monoxide. While we all appreciate cleaner air, it’s the Peace Lily’s occasional white bloom that makes it such a popular house plant. When it comes to caring for the Peace Lily, the rule of thumb is “it all depends.” It all depends on light, foliage, soil, and room temperature. Light: Medium, indirect sunlight. Yellow leaves indicate the plant is getting too much light. Temperature: No lower than 55 degrees—not even the breeze from an open door or window. If you need a jacket, your tropical plant needs one also. Water: One of the great advantages in maintaining the Peace Lily is that it droops when water is needed. However, there are still a number of factors that can affect how often you water. The warmer the room temperature, the more water your plant will use. Wintertime heating is very drying and plants in the house will use more water in winter than in summer, generally. Water thoroughly with room temperature water, that is, pour water all around the soil until water comes out of the drain holes at the bottom. Standing water should not be left in the saucer for more than 15 minutes. No need to water again until the surface of the soil is just about dry (soil just beneath the surface should be slightly moist). The time between watering depends on how much light the plant is receiving and the room temperature. This is why checking soil moisture before watering is important. Fertilizer: To ensure the best blooms, use fertilizer in the water according to package directions during summer months. The Peace Lily will acclimate to a variety of indoor environments, and when in full bloom, it’s simply a beautiful plant that can make a statement in your home or office. 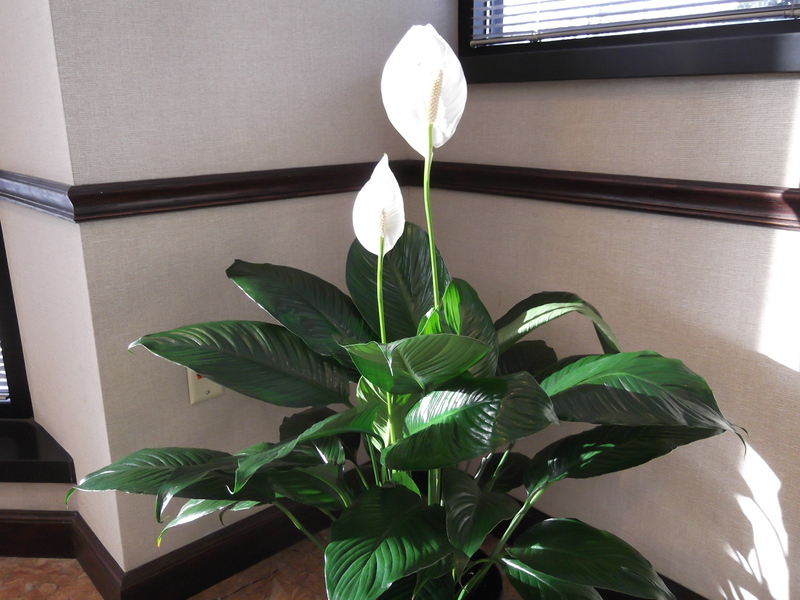 Disclaimer: The Peace Lily, as with many plants, should not be ingested by humans or animals. Doing so can cause skin irritation, stomach discomfort, and other minor side effects. This entry was posted in At Home, At Work, Green Scene, Interior by Eric Engledow. Bookmark this link. My peace lily has brown leafs and looks like it is dying. What can I do to save it. Hi Dawn. What kind of light is the plant in? Does it receive direct sunlight? If so, how much? Has it ever sat in standing water for longer than 15 minutes? Has your plant ever wilted? Thank you for your message! Interior tropical plants do very well in offices. But there are many different kinds that all thrive under varying conditions. If it’s going to be placed in an area with low-light, I would suggest sansevieria (mother-in-law’s tongue) or a dracaena (Janet Craig Compacta or a Lemon-Lime). In medium light environments, Philodendrons tend to do very well. In high light environments, a Ficus tree or some type of palm, like a pony tail palm, would be your best bet. A bromeliad might be a good gift. They have beautiful flowers and the plants typically do well in a variety of light conditions. Hope that helps! My Peace Lily grows well in water. I used a pot with water and just place my Peace Lily and in it and it grows to be more beautiful and healthy.